For any driver, there’s a pride that comes with seeing their name on the roof of the car they’re racing. 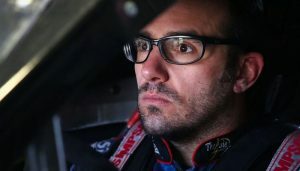 But this weekend at New Hampshire Motor Speedway, Woody Pitkat is hoping it will be someone else’s name on the Modified he’ll race in Saturday’s NASCAR Whelen Modified Tour F.W. Webb 100. Pitkat, of Stafford, will replace the late Ted Christopher in the No. 82 Danny Watts Racing entry at New Hampshire Motor Speedway. Christopher was killed in a plane crash Saturday in Connecticut. He was flying Riverhead Raceway in Riverhead, N.Y. to compete in the No. 82 ride in a Whelen Modified Tour event. “Obviously it’s a huge honor,” Pitkat said. “I’m already trying to think about like the emotions I’m going to have just getting in the car for the first time. I’m hoping that it will still say “TC” on the roof. But it’s going to be gutwrenching. It’s definitely going to be emotional. But at the end of the day I know Ted was a racer. … I know us grieving, I know up in the sky he would probably be saying ‘What the hell’s your problem?’ He’d want us to race. Danny Watts Racing announced Pitkat as their choice for the weekend on through a statement on Facebook Monday. Pitkat was a fan of Christopher’s long before he was driving a Modified. Pitkat said he used to spend a lot of time flying to events with Christopher and relayed a story of one time when he lost his seat to an anxious Christopher. They had flown together to Mansfield, Ohio for a Whelen Modified Tour race on Aug. 23, 2007. It was Pitkat’s first season competing with the series. He finished third in the event and had to meet with the press following the finish. Christopher had finished eighth and wanted to get home. “That was the first time I finished on the podium with the Tour,” Pitkat said. “I was trying to take all that in. I had never had gone where you had to go see the press and all that stuff. To me it was a big deal. Thanks to Danny Watts and Woody for running the car. Ted Christopher woulld be fuming mad if that car sat idle in the shop. I’m bumming bigtime over the loss of TC, but I will be at NHMS cheering on the #82 modified with tears under my sunglasses. Thoughts and prayers to TC’s family and his racing family. What an honor for Woody. He will drive his tail off and give the #82 car the run it deserves.